Lowell Elementary School, 1210 S. 1st Avenue, Phoenix, Arizona. Acrylic on stucco. (exterior courtyard painting), painted mural. 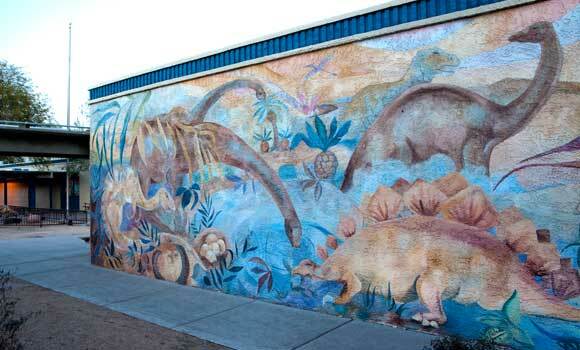 Using information from presentations by a paleontologist, geologist, hydrologist, and a trip to the Southwest Museum of Dinosaurs, Glen worked with a group of thirty 5th grade students to create the mural. The project included construction of a timeline of factual information showing when, where, and which dinosaurs were found in the local region. Students from all age groups contributed to this project. 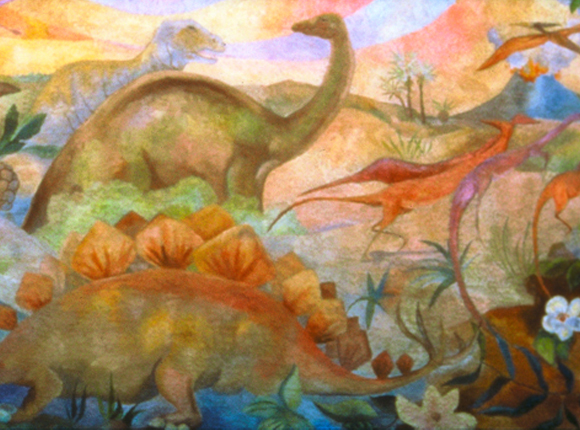 The painting is the product of the integrated studies of science and art. Even Glen had the chance to research and learn more about Dinosaurs.